There are many ways that you can help build the peace voting bloc and make this a movement that the politicians can no longer ignore! We have seven great ideas for you below, as well as resources to help you get started. If you have any additional ideas, email them to action [@] VotersForPeace.org. We welcome your feedback! 1. Start your own VotersForPeace pledge drive! You can help build the peace movement by downloading our pledge form and getting all of your friends and family to sign the pledge. Better yet, use the pledge as a way to build your own membership base and community visibility! Use it as leverage to meet with local candidates and incumbents, create a media buzz around the pledge, and show your elected officials that they cannot ignore peace voters! 2. Host or attend a Cancelled Check Party! Host a Cancelled Check party to divert hard cash contributions from pro-war candidates. We give you all the tools you need to sign-up to host, find, or organize a party! 3. Display a VotersForPeace lawn sign or bumper sticker! Help advertise VotersForPeace with these brightly colored lawn signs and bumper stickers. Buy a package to bring to local events or give them to your friends and family! 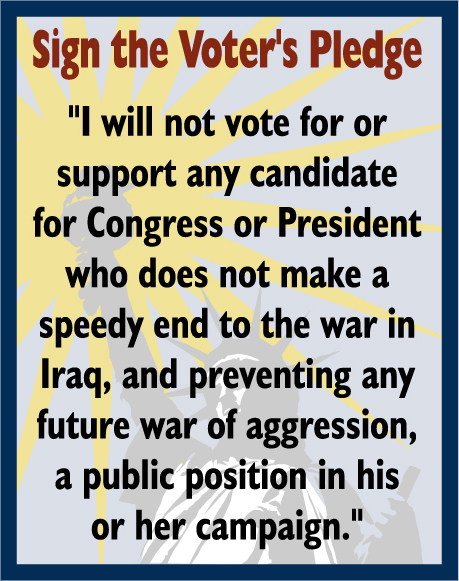 Locate your Congressional Representative or Senator and tell them you signed the VotersForPeace pledge! Tips for writing a letter that will be published -- coming soon! People often have "email signatures" about something that Margaret Mead or Gandhi said. Put the Voters' Pledge in your e-signature and spread the word about the pledge to everyone in your email network! 7. Advertise the VotersForPeace pledge on your website or print materials! You can link to our pledge page from your website using one of logos below. Click on the image to get the full graphic and URL location. For the full html code to link to our pledge page, click on the file name below the graphic.